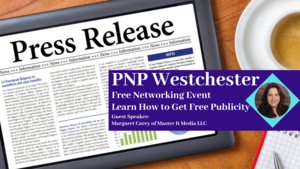 All are welcomed to join the Professional Networking Powerhouse (PNP) of Westchester for their monthly meeting on Tuesday, March 19 from 6-8:30 PM at Buon Amici, 238 North Central Avenue, White Plains, NY . Come for networking at 6 PM, then everyone will have the opportunity to introduce themselves, have a bite to eat, listen to our guest speaker and network some more! The event is free to attend, you only pay for what you eat and drink. Bring business cards! Did you know that a successful story about your company could result in FREE publicity? Margaret will share insights on how to identify what is newsworthy about your business and how to share that with the media outlets in our area. Find out more about Master It Media at www.masteritmedia.com. Join us and see what PNP can do for you. Professional Networking Powerhouse was founded in September 2013. Our mission is to provide small business owners and salespeople in The Hudson Valley with a free resource to come together and help each other grow their businesses. For more information visit www.pnphv.com.